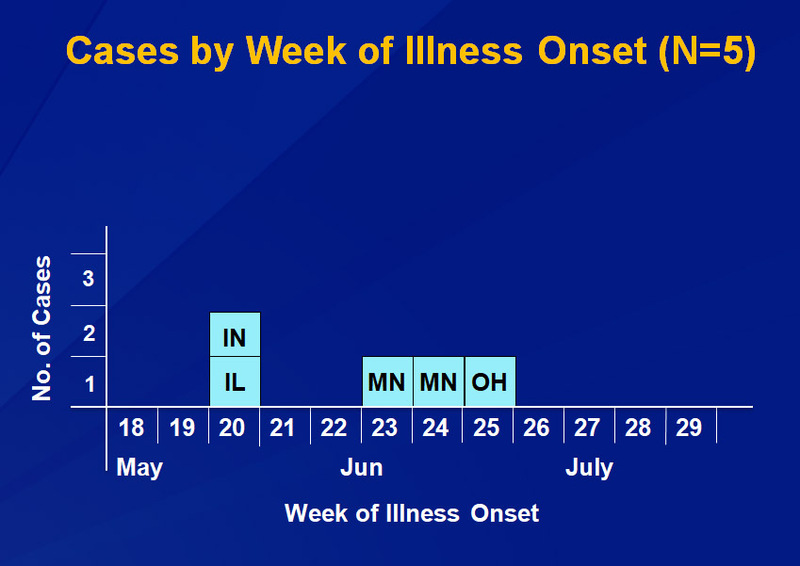 Five outbreak cases of listeriosis were identified in Minnesota, Indiana, Illinois, and Ohio. The use of the CDC Listeria Initiative questionnaire to identify a soft cheese signal, along with re-interviewing cases (or their proxies) and calling restaurants to get specific details on cheese brand and cheese type were critical in identifying the outbreak vehicle. Environmental isolates in the PulseNet national database that were collected from the Crave Brothers cheese production plant (and indistinguishable from outbreak case isolates) were also a key supporting clue. These clues led to the testing of Crave Brothers cheese samples and detection of the outbreak stain in this product. This investigation resulted in perhaps the fastest identification of a commercially distributed food vehicle of a listeriosis outbreak; the cluster was detected in Minnesota on June 27 and public health interventions were implemented on July 3 (6 days later). This was a remarkable accomplishment, especially with only 5 cases to work with. The rapidity of the investigation can be attributed primarily to the urgency displayed by the lead investigator and the aggressive acquisition of details on brand and type of soft cheese consumed, in collaboration with epidemiologists in the other affected states. 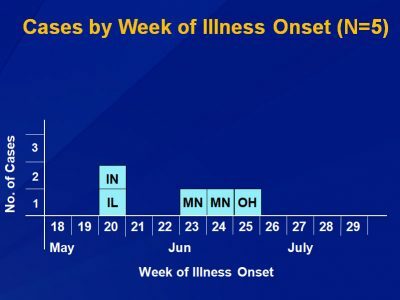 The MN CoE has created a detailed case study about this investigation that can be used for training public health practitioners in outbreak investigation. Public Health students love it too! A multi-state outbreak of listerosis associated with soft cheese from Crave Brothers. 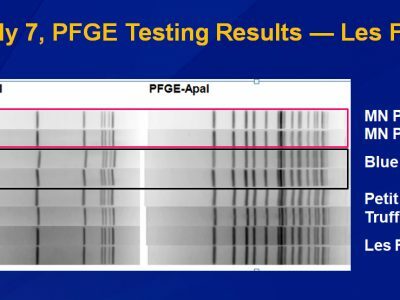 On June 27, 2013, the Minnesota Department of Health (MDH) Public Health Laboratory (PHL) determined that two clinical Listeria monocytogenes (LM) isolates submitted through routine surveillance had indistinguishable PFGE patterns. A review of the national PulseNet database revealed three additional LM isolates with the outbreak PFGE pattern in Indiana, Illinois, and Ohio. A multi-state investigation was initiated. 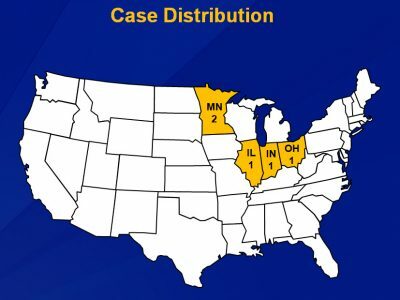 Five cases from three states were ultimately identified in this outbreak (Minnesota, 2; Indiana, 1; Illinois, 1; and Ohio, 1). In addition, subsequent whole genome sequencing efforts identified another likely case in Texas, but exposure information was not available. Four (80%) cases were female and the median age of the cases was 55 years (range, 31 to 67 years). All five cases were hospitalized and one died. Listeria Initiative case report forms were completed for all five cases and all five reported consuming a variety of soft cheeses. Potato salad was reported by both Minnesota cases; however, no other cases reported consuming it. Epidemiologists conducted a case-case comparison study to compare outbreak case food consumption rates against estimated background consumption rates using non-outbreak associated LM cases. LM cases with the outbreak PFGE pattern were significantly more likely than sporadic LM cases to have consumed any soft cheese (odds ratio, 16.8; 95% confidence interval, 1.2–∞) and yogurt (odds ratio, 7.5; 95% confidence interval, 1.3–∞). Review of the initial interviews revealed that cases reported different brands of yogurt, making this an unlikely source of illness. 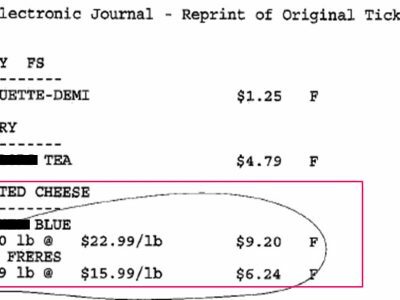 The Minnesota cases were re-interviewed to get additional specific product details on the soft cheese exposures. The first Minnesota case reported consuming a cheese plate at a restaurant in North Dakota. The investigator called the restaurant which reported that the cheese plate included Crave Brothers Les Frères cheese. 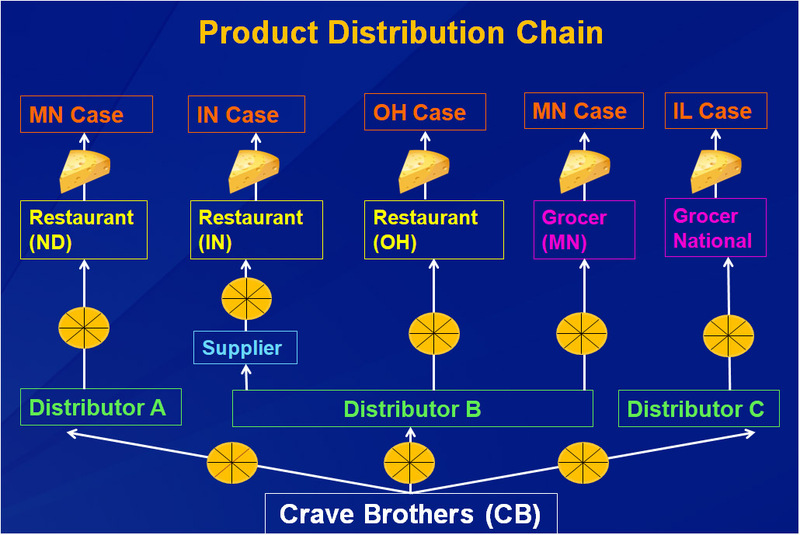 The Illinois case reported consuming Crave Brothers Les Frères cheese purchased from a grocery store. The Indiana case reported consuming a cheese plate at a restaurant, and a review for the restaurant menu indicated that Crave Brothers Les Frères was served on the cheese plate. The Ohio case was re-interviewed and also reported consuming a cheese plate at a restaurant which included Crave Brothers Petit Frère cheese. 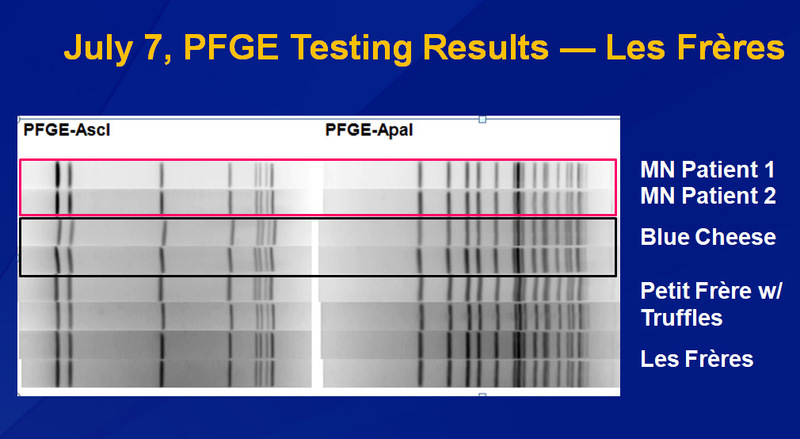 PulseNet identified non-human isolates in PulseNet with the outbreak PFGE pattern that had been collected from the Crave Brothers cheese production facility in 2010 and 2011. 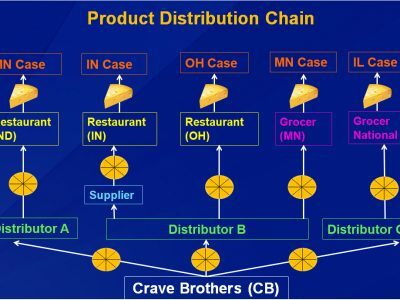 On July 1, Crave Brothers cheese was collected for testing from two locations of the grocery chain where MN case #2 had purchased the product, and submitted to Minnesota Department of Agriculture (MDA) for LM testing. In addition, leftover blue cheese, Irish cheddar, parmesan cheese, and an unknown hard cheese were collected for testing from MN case #2’s home. By July 3, Enzyme-linked Fluorescent Assay results indicated that a wedge of Crave Brothers Petite Frère with Truffles from one grocery store location in Minnesota, two wedges of Crave Brothers Les Frères from another location of the same grocery store chain in Minnesota, and a wedge of blue cheese collected from MN Case #2’s home all tested positive for LM. 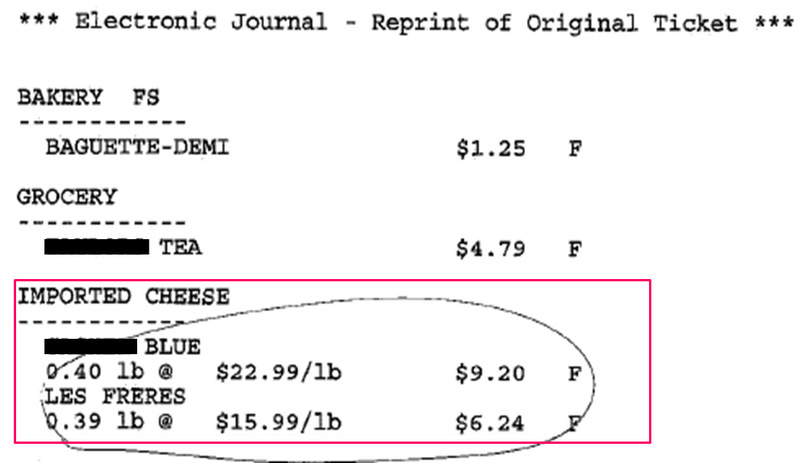 A traceback of the Crave Brothers cheese consumed by the cases revealed that the cheeses had different distributors, which indicated that the source of the contamination was the Crave Brothers plant. A press release was issued warning consumers not to eat Crave Brothers Les Frères, Petit Frère, and Petit Frère with truffles and Crave Brothers issued a voluntary nationwide recall of these cheeses. The spouse of the second Minnesota case called investigators to report that he thought they had purchased Crave Brothers Petit Frère. He did not have a receipt but had used a credit card to make the purchase. The investigator contacted the grocery store and gave them the credit card transaction numbers, the date of the transaction, and the dollar amount of the transaction. Using this information the store was able to reprint the original receipt with included Crave Brothers Petit Frère. This was a multi-state outbreak of LM infections associated with Crave Brothers cheese. The use of the Listeria initiative questionnaire along with re-interviewing cases (or their proxies) and calling restaurants to get specific details on cheese brand/type were critical in identifying the outbreak vehicle. Environmental isolates in the PulseNet national database that were collected from the Crave Brothers cheese production plant were also a key supporting clue. This investigation resulted in perhaps the fastest identification of a commercially distributed food vehicle of a listeriosis outbreak.